At our excellent evening at Mosimanns, I thought Kevin was utterly brilliant - coherent, thought provoking and very inspiring. I can't wait for his book so I can leverage its content at work. It was a priviledge to be there and I wish even more people heard it. An invaluable insight into a study into leadership. Great communicator who related well with the audience. Interesting and engaging speaker with good stories and practical advice. A very inspiring insight. Extremely good- a nice balance between theory and real-world experience. The feedback on your talk was, in a word, overwhelmingly, fabulous! You contributed greatly to the discussions that took place throughout the week, and already I have received no fewer than a half dozen e-mails from our programme participants indicating that your remarks about leadership have resonated greatly. 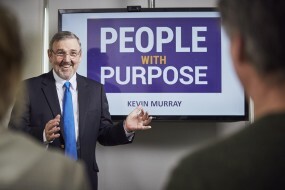 Kevin was inspiring in his talk to 80 senior leaders at London Probation. He gave an excellent summary of his findings and was able to clearly set out the lessons learnt from leaders in all sectors . Senior staff were discussing his talk for several days after the event and many people have gone on to read his book and to put into practice the lessons learnt. This should improve our leadership and in turn the services we provide. I have recommended his book to other public sector leaders who would benefit from the opportunity to improve their leadership skills. Thank you for taking the time to participate in the inaugural session of the Distinguished Executive Address series. The feedback has been tremendous – many stating that it was one of the most informative and enjoyable presentations that they have attended. The audience was most impressed by your focused outline of leadership. One particular feedback comment from a CEO summed up the evening: ‘What a fine speaker yesterday evening. A formidable, and also very fine (and human) communicator at the top of his game’. Thank you for the informative and interesting talk. The students were really inspired by what they heard - as we travelled across London I heard words such as 'mindblowing', 'inspirational', 'brilliant', 'fantastic’! Looking at the emails flying about today, some of the students are already well into the book. We have now had feedback from our conference attendees. When asked “What was your favourite session?” – hands down, your session received the most votes. Your presentation was highly motivating and gave very practical advice. We had a very successful Leadership Forum in Cape Town last week and your presentation is likely to be very helpful to our leaders as we work at becoming better communicators and to inspire our teams. Learning from the experience and practice of top leaders as well as the practical framework you discussed will be valuable. It was a real pleasure to meet you and I thank you for joining us. I must congratulate you on your presentation which was not only insightful but very inspiring. The research you conducted for your book and the framework you developed to explain your thinking were very helpful for us as a business. Your presentation was authoritative, entertaining and highly informative, and as you know generated a lot of discussion. When participants were asked what was the most useful or enjoyable session: Kevin Murray for his depth of knowledge and for making it personal and relevant. Kevin Murray was fantastic, very capitivating and useful discussion points. A superb conference. On behalf of the Dell UK leadership team, thank you for joining our meeting yesterday. We do a round-up at the end of the 2 day meeting to evaluate what was valuable, productive, a waste of time, ect, and the session with you stood out as the highlight of the 2 days. It got a lot of people thinking and I have heard your message around inspiration repeated a number of times since. Colleagues were very impressed. It changed their perspective on leadership and communication and they learnt from the conversation. There is little I love more than to inspire leaders and managers to raise their games, to understand the importance of soft skills, and to be more motivating and successful. To do this, I have had to become an accomplished speaker, having given hundreds of talks to a wide range of audiences, in an equally wide variety of locations, countries and circumstances. My subject is communication and leadership, and how to become a far more inspiring leader and manager. My talks are based on more than 100 CEO interviews, and research involving more than 2000 senior managers around the world, and 6,000 employees. I am as comfortable on a stage in front of an audience of hundreds, as I am in a board room with only a dozen people, or in front of a computer screen doing global webinars. I have talked to businessmen from different market sectors, leaders from public sector organisations in different countries, as well as hundreds of university students. I have been a keynote speaker at conferences and seminars, at company leadership events, as well as literary events. I have spoken at events in Europe, South Africa, the Middle East, the USA and all over the UK. My talks vividly bring to life my background research, my learnings from interviews with 100 global CEO’s and leaders, the revealing and humorous stories told me by those leaders about their successes and failures, as well as the models and tips I have developed on how to communicate to inspire.